The AXIe standard will reach its 3rd anniversary in June and the interest is growing for this relatively new standard. Interestingly enough this year AXIe’s sibling PXI will be turning 15! 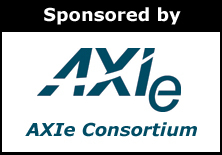 Our AXIe Consortium LinkedIn membership numbers continue to increase and we are now a community of 290 members. AXIe Consortium members in the technical and marketing committees and the board of directors will be getting together in Loveland, Colorado in March. The members will discuss and define the next steps for the standard, showcase AXIe products and exchange best practices. It will be exciting for everybody to get together and I am eager to see the outcome – so stay tuned and enjoy this issue of the AXIe newsletter. Happy reading! In many multichannel high speed data acquisition applications, such as radar, satellite (beam-forming), MIMO, or high-energy experiments, it is critical to have phase coherent channels for accurate data acquisition whether for demodulation, antenna calibration, channel sounding, or event capture. Large-scale experiments may require the use of tens or hundreds of synchronized channels, and very precise time correlation between channels. Therefore, synchronization across multiple instruments is primordial. This application note describes the measurement and analysis of cross channel skew in multichannel high speed digitizers over short and long durations to sub-picosecond scales. Two measurement techniques using the Agilent High Speed Digitizer which is designed according to the AXIe architecture are described and compared, and the results presented. Real time high-speed streaming enables a number of applications previously unrealized. Radar system evaluation and simulation is an example, where data is streamed indefinitely from high-speed digitizers into a data processing module or RAID array. High-energy physics is another example where data is recorded for long periods, to be triggered by an event that is detected by a digital processor unit. Indeed, there is a broad range of data acquisition applications where long data streams need to be recorded or processed while searching for an intermittent event. The AXIe local bus enables this capability at previously unattainable speeds. E-Beam (Electron Beam) lithography is a next-generation maskless semiconductor manufacturing process. Being maskless, it eliminates diffraction limitations found in current photolithography for 20nm or smaller processes. E-Beam lithography requires a data streaming system with very high throughput that simultaneously transfers massive amounts of pattern data from a data server, processes the data, while outputting to an E-Beam tool. The E-Beam tool itself interfaces through thousands of fiber optic channels and requires channel-to-channel skew less than 2ns. Based on the challenging density and performance requirements, ADLINK chose the AdvancedTCA Extensions for Instrumentation and Test (AXIe) architecture to implement E-beam streaming. This article describes how the AXIe platform was leveraged to achieve these demanding density and synchronization requirements.